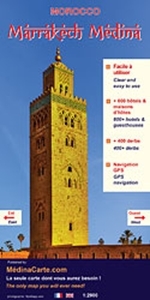 The Medina of Marrakesh, the city’s historic heart, on a large, well-presented and very detailed street plan from Medinacarte with a wealth of tourist information, including locations of over 600 hotels and guesthouses, individual souks annotated to show what types of goods are sold there, etc. Unlike other maps of Marrakesh, this plan names not only the main streets within the Medina but also smaller ones, including over 400 derb passages. Colouring differentiates between buildings of traditional or modern architecture, indicates public parks or gardens, street markets, etc. Symbols mark various facilities: over 600 hotels and guesthouses, cafes and restaurants, banks, ranks for taxis or horse drawn carriages, public phones and internet cafes, medical help, etc. The route of the cross-Medina bus line is shown with stops. Streets with souks and markets are highlighted, indicating what goods are sold there and where appropriate, doors which are locked at night. The plan is accompanied by an index of streets and derbs, a list of hotels and guesthouses marked on it, plus a list of GPS coordinates for 36 important buildings and locations within the area. On the back cover of the map there are two at-a-glance plans highlighting locations of main points of interest and of the Medina’s gates and districts. Map legend and accompanying text are in French and English. 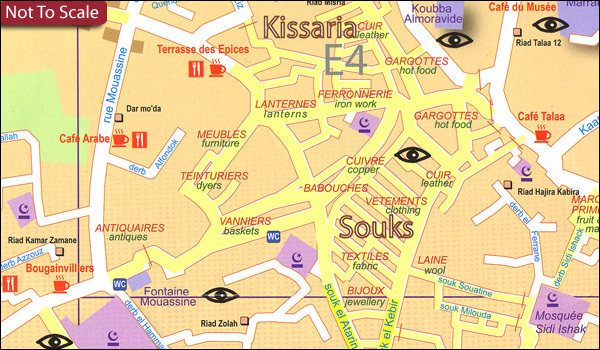 PLEASE NOTE: this map covers just the Medina area of Marrakesh, the rest of the city is not included. Medinacarte also publish a pocket, double-sided Mini Map of the Medina - handy size, but with less information than presented in this version.